Lemons are definitely attractive and at the same time taste delicious. Those who like lemons love it in any form, be it a drink, dessert, pickle, biscuit, or even added to a main dish, soup or salad, or just gently squeezed over fried seafood. My husband and elder son, too, belong to the above category. They just love lemon flavour in anything. I confess that I too indulge in a slice of lemon with a shot of tequila once in a while! 😉 Therefore, you are certain to find a dozen lemons (at least!) in our kitchen. This versatile fruit originates in the Mediterranean, and plays a major role in Mediterranean cuisine. The Spanish, Italians, Greeks and Moroccans use lemons liberally in their cuisine. I find that the lemon is a grand ingredient for use in desserts, eg. Lemon meringue pie, Lemon tart, Lemon cake, Lemon squares, Lemon cheesecake and many more. 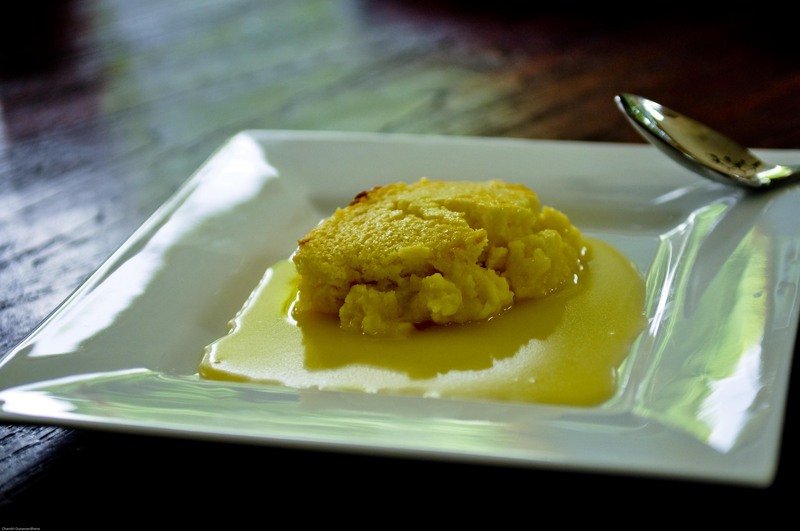 Lemon pudding is a delicious tangy dessert, and comes in various versions, from self saucing to Gâteau. I have tried several of them and come up with my own favourite version which is a combination of a couple of varieties, and is quick and easy to make. Once it is baked, you can serve it with lemon sauce. For the lemon sauce, I heat a spoon of butter, and then I add some icing sugar and stir it until it’s dissolved and, finally, add a couple of spoons of lemon juice and a bit of lemon rind. Once it is stirred into a smooth sauce, I scoop some lemon pudding onto a serving dish and add some sauce onto the pudding. Ready to eat, and sure to make your guests politely reach for a second serving!